Born in Itta Bena, Mississippi, King spent much of his childhood sharing time living with his mother and his grandmother and working as a sharecropper. King has said he was paid 35 cents for each 100 pounds (45 kg) of cotton he picked before discovering his other talents. At an early age, King developed a love for blues guitarists like T-Bone Walker and Lonnie Johnson and jazz artists like Charlie Christian and Django Reinhardt. Soon King was cultivating his own musical skills singing Gospel music in church. In 1943, King moved to Indianola, Mississippi. Three years later, King moved to Memphis, Tennessee, where he finely honed his guitar technique with the help of his cousin, country blues guitarist Bukka White. In the winter of 1949, King played at a dance hall in Twist, Arkansas. In order to heat the hall, a barrel half-filled with kerosene was lit, a common practice. During a performance, two men began to fight, knocking over the burning barrel and sending burning fuel across the floor. This triggered an evacuation. Once outside, King realized that he had left his guitar inside the burning building. He entered the blaze to retrieve his guitar, a Gibson acoustic. Two people died in the fire. The next day, King discovered that the two men were fighting over a woman named Lucille. King named that first guitar Lucille, as well as every one he owned since that near-fatal experience, "to remind me never to do a thing like that again." Eventually, King began broadcasting his music live on Memphis radio station WDIA, a station that had only recently changed their format to play all-black music which was extremely rare at the time. On the air, King started out using the name The Pepticon Boy, which later became the Beale Street Blues Boy. The name was then shortened to just Blues Boy and, eventually, simply B.B. In 1949, King began recording songs under contract with Los Angeles based RPM Records. Many of King's early recordings were produced by Sam Phillips, who would eventually found the legendary Sun Records. In the 1950s, King became one of the most important names in R&B music, collecting an impressive list of hits under his belt that included songs like "You Know I Love You," "Woke Up This Morning," "Please Love Me," "When My Heart Beats like a Hammer," "Whole Lotta' Love," "You Upset Me Baby," "Every Day I Have the Blues," "Sneakin' Around," "Ten Long Years," "Bad Luck," "Sweet Little Angel," "On My Word of Honor," and "Please Accept My Love." In 1962, King signed to ABC-Paramount Records. In November of 1964, King recorded the legendary Live at the Regal album at the Regal Theater in Chicago, Illinois. King first found success outside of the blues market with the 1969 remake of the Roy Hawkins tune, "The Thrill Is Gone," which became a hit on both pop and R&B charts, which is rare for an R&B artist even today. King's mainstream success continued throughout the 1970s with songs like "To Know You Is to Love You" and "I Like to Live the Love." From 1951 to 1985, King appeared on Billboard's R&B charts an amazing 74 times. The 1980s, 1990s and 2000s saw King recording less and less, but maintaining a highly visible and active career appearing on numerous television shows, major motion pictures and performing 300 nights a year. In 1988 he reached a new generation of fans via the single "When Love Comes To Town", together with the Irish band U2. In 2000, King teamed up with guitarist Eric Clapton to record Riding With the King. In 2003, he shared the stage with legendary rock band Phish in New Jersey, performing three of his classics and jamming with the band for over 30 minutes. 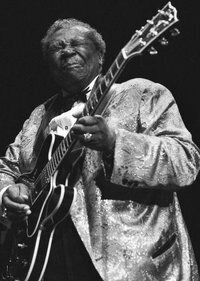 In 2004, King was awarded an honorary Ph.D from the University of Mississippi and the Royal Swedish Academy of Music awarded him the Polar Music Prize, for his "significant contributions to the blues". King had also donated his extensive blues collection to the Ole Miss Center for Southern Studies. In 1997 an Ole Miss Alum tourist was killed by the bouncers in BB King's Memphis Night Club before scores of eyewitness patrons. A growing controversy exists around the murder and BB King has never commented publicly about the crime. Beale Street Club Settles Lawsuit., Murder in Memphis. At 80, King has lived a very full and active life. He has been a licensed pilot, a known gambler and is also a vegetarian, non-drinker and non-smoker. A diabetic for over ten years, King has been a visible spokesman in the fight against diabetes and has appeared in advertisements for diabetes-management products.